According to the 1962 Missal of Bl. John XXIII the Extraordinary Form of the Roman Rite, today is the feast of St. Bridget of Sweden, widow. It is also the feast of Sts. Sergius, Bacchus, Marcellus and Apuleius, Roman martyrs. In the Ordinary Form of the Roman Rite, these martyrs, plus many others, are honored on June 30 and St. Bridget is celebrated on July 23. Sergius and Bacchus were martyrs under the Diocletian persecution around the year 303 A.D. Legend states that Sergius was an officer in the Roman army and Bacchus an officer under him, and both were friends of Emperor Maximian. When they did not enter a temple of Jupiter with the Emperor, he ordered them to do so. When they further refused his order that they sacrifice to pagan gods, they were humiliated by being led through the streets of Arabissus in women's garb. Maximian then sent them to Rosafa, Mesopotamia, where they were scourged so terribly that Bacchus died of the scourging. Sergius was then tortured further and beheaded. Symbols: Former with cross; white shield with gold cross fleuree; scourges. Read more about these martyrs from the Catholic Encyclopedia. 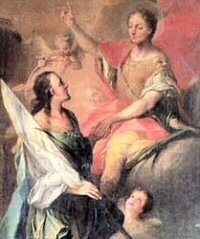 At Rome, the holy martyrs Marcellus and Apuleius, who at first were followers of Simon Magus, but seeing the wonders performed through the Apostle Peter, they abandoned Simon and embraced the apostolic doctrine. After the death of the apostles, under the proconsul Aurelian, they won the crown of martyrdom and were buried near the City. Saint Demetrius was born to a wealthy, noble family and raised Christian. He was a soldier and a Deacon. He was raised to the rank of Duke of Thessaly by the Emperor Maximian. But when he was found to be a Christian he was arrested and imprisoned in a bath-house. He was run through with spears c.306 at Sirmium (in modern Serbia). St. Demetrius was extremely popular in the Middle Ages and was reported to have appeared during a battle in 586, centuries after his death to help defend Thessalonica. Over 200 churches in the Balkans are known to have been dedicated to him. His relics were said to emit holy oil. Demetrius was probably a deacon who was martyred sometime before the fifth century at Sirmium (Mitrovic in former Yugoslavia). During that century two churches were built in his honor, one at Sirmium and the other at Thessalonica. It may be that the cult of the saint migrated from Sirmium when Leontius, the prefect of Illyricum, moved the seat of civil suthority to Thessalonica–he is reputed to have built both churches. Certainly Demetrius was honored as a saint at Sirmium before the church at Thessalonica was built. Sirmium, however, was destroyed by the invading Huns in 441, and it was the second church that became the principal center for the cult of the martyr and attracted very large numbers of pilgrims. The church was destroyed by fire in 1917 but has since been rebuilt; it was obviously meant to hold a great number of people. In time Demetrius became known as "the Great Martyr," and a legend grew up about his life. According to this he had been a citizen of Thessalonica who had been arrested for preaching the gospel and executed without trial in the local baths.The church was built over the baths and incorporated part of them as a kind of crypt. At a later date relics of the saint were said to exude a miraculous oil, but the arrangements whereby the pilgrims could collect some of this seem to have been quite fraudulent. The earliest written account we have dates from the ninth century and says that the order for his execution came from the emperor Maximian himself. Later accounts make out that he was a proconsul (this is how the Roman Martyrology described him) or a warrior-saint similar to St. George and second only to him in popularity. He as one of the saints adopted by the Crusaders as their patrons in battle. None of these later accounts can be trusted, though we can be sure of the existence of a martyr of that name. His feastday is kept with great solemnity throughout the Eastern Church on October 26, and he is named in the preparation of the Byzantine liturgy. The popular Slav name, Dmitry, comes from him. His cult was popular also in Ravenna in Italy, where the earliest chapel was dedicated in his honor. The original basilica, destroyed in 1917, had important mosaics from the sixth to the ninth century; in these Demetrius was portrayed as a deacon. More often he was depicted as a soldier.